Because she insists on fighting with words instead of her fists, 13-year-old Nita is regularly tormented by a gang of classmates. One day, running to escape their blows, she hides in the only safe place nearby-the library. When a book about wizardry catches her eye, Nita finds the help she needs in its pages. As she moves from chapter to chapter, Nita learns more sophisticated spells. Soon, stepping through a worldgate, she enters a shadowy city swirling with vicious taxicabs and carnivorous fire plugs. What begins as a simple quest quickly becomes a struggle to keep a powerful and ominous force from passing back into Nita's world. 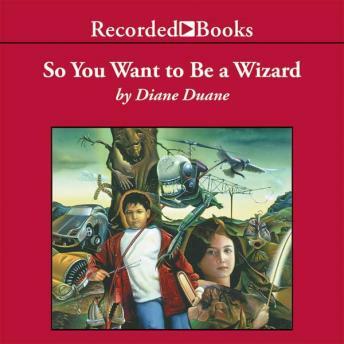 Ranked with the best of Madeleine L'Engle and Diana Wynne Jones, Diane Duane's magical tale of wizardry and wisdom has become a modern fantasy classic. Christina Moore's delightful narration captures all the excitement and danger in this thrilling fantasy adventure. I loved this story growing up so listening to it again now has been a real treat; great narration too! Truly brings the characters to life!